Yesterday, while wandering the streets of Galway around the river, I found myself in front of a Catholic church built in the 1800s. I stepped inside, eager to explore a tradition with which I was unfamiliar. I had been in Catholic churches before, but only on guided tours with a camera in my hands and a ball cap on my head. This was different. This was an opportunity to find a new experience. I was alone inside the old church, and the silence was overwhelming in a city that otherwise was suffocated by the noise of traffic, crowds, and the river. I walked past a statue of St. Francis of Assisi, turned toward an organ, and made my way up the church to the front pew. There, I sat down in silence and looked around the bright room, engulfed in its old and magnificent imagery. The silence was almost alarming, as I had hardly a moment of solitude since my arrival in Ireland. I worried that somebody might come in and tell me I was in the wrong place, or ask me how I got past the Swiss Guard. After a while, though, I closed my eyes and listened to nothing, and managed to stop thinking for a few soft moments. After a while, I opened my eyes, took out my notebook, and wrote a simple, one-page poem. I wrote it slowly, deliberately, one word at a time. I rarely take such care when writing. It was a brief poem entitled “To Whom It May Concern.” I tore it from my notebook, rose quietly from my seat, and placed it on the altar. After that, I left quickly, afraid that I would be caught. I do not remember the contents of the poem. After I left it on the altar, it no longer belonged to me. It was a gift to the first person to find it. All I remember about it is that I felt satisfied when I finished it, that it was about light, that it ended with the line “Dona Nobis Pacem,” and I signed it “jk.” Perhaps they will think I was joking, or maybe it’ll be thrown away, or maybe it will be read aloud at Sunday Mass by a curious priest. For me, it was out of the ordinary, but I felt peaceful when I placed the paper on the sunlit altar. I’ll never know what happened to that little poem; all I know is that it set sail for uncharted territory just as I did two weeks ago. 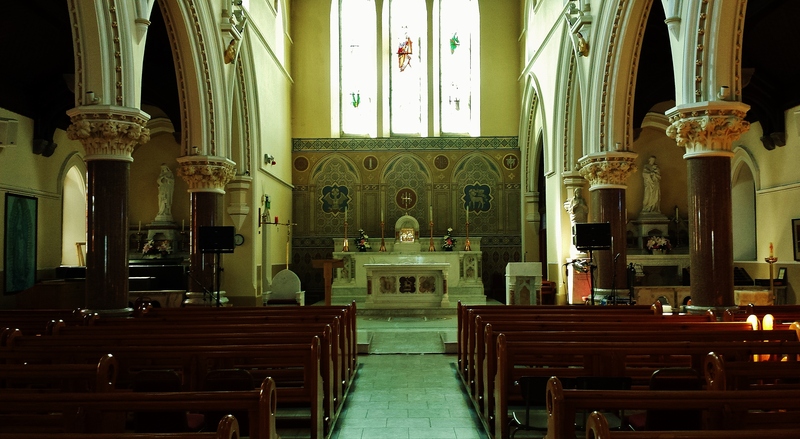 This entry was posted in Philosophy, Theology, Aeasthetics, and Politics, Photography, Poetry, Writing and tagged Cathedral, Catholic, Church, Galway, Introspection, Ireland, Meditation, Poem, Prayer, Reflection, Spirituality on July 6, 2014 by keeneshort. I never know what to say about your musings. But I enjoy contemplating the elegant insights you share on occasion. I enjoy reading the posts of someone so obviously in love with thinking and with writing. We sometimes forget that a church offers a place of solitude that can be very important when the world is too noisy, too busy, and too demanding. I hope your poem has taken a life of its own and someday you can find out what happened to it.